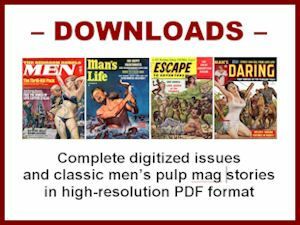 Late last year, my publishing partner Wyatt Doyle and I released the initial print edition of our second anthology of classic men’s adventure magazine stories, HE-MEN, BAG MEN & NYMPHOS via his New Texture book company. Like our first anthology, WEASELS RIPPED MY FLESH!, the NYMPHOS collection is heavily illustrated with the original magazine covers and interior artwork. 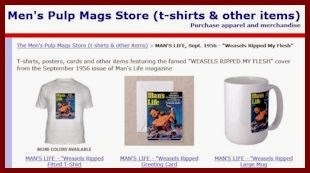 Unlike WEASELS, which included stories by and interviews with many great writers (including Lawrence Block, Harlan Ellison, Bruce Jay Friedman, Mario Puzo, Robert Silverberg and Walter Wager), HE-MEN, BAG MEN & NYMPHOS features stories by one lesser-known but equally great writer named Walter Kaylin. Puzo is now dead. Walter is still alive, though he’s now in an assisted living facility. Whenever I do, I am reminded of what an honor and pleasure it is to have been to have gotten to know him and to make Mario Puzo’s wish come true by reprinting two of his classic men’s adventure magazine stories in the WEASELS anthology and 13 more in the NYMPHOS anthology. Since we released the print editions of those books, the publishing technology available to independent publishers like us has continued to advance. It’s now possible to create heavily-illustrated full color ebooks with full color illustrations and photos. And, recently we released the color ebook edition of NYMPHOS. You can download it worldwide on Amazon, Barnes & Noble and other online booksellers. I’m showing some of the actual layouts from the ebook edition in this post so you can see just how cool it looks on a monitor, an iPad or any full color ebook reader. The book includes 13 classic men’s adventure stories by Walter. They range from exotic adventure yarns, war stories and Westerns to gritty gangster stories and even a science fiction tale with future Nazis. 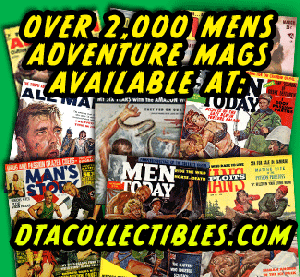 Every story shows a full color shot of the cover of the men’s adventure magazine it was first published, plus all of the interior artwork or photos used for it inside. The artwork in the 13 stories we picked is by some of the best pulp illustration artists of the era, including Norman Baer, James Bama, Charles Copeland, Gil Cohen, George Eisenberg, Mort Kunstler, Joe Little, Don Neiser, Earl Norem, Julian Paul, Walter Popp, Al Rossi, Harry Schaare and Robert Schulz. In addition to the stories, the NYMPHOS anthology also provides some exclusive new content, including: a chapter of reminiscences by Walter about his writing; a moving and insightful preface by his daughters Jennifer Kaylin and Lucy Kaylin, who became successful writers and editors in their own right; and, a fascinating interview with the famous writer Bruce Jay Friedman, who was the editor of several of the men’s adventure magazines that Walter and Mario Puzo wrote stories for before he became an acclaimed novelist and playwright (such as MEN, MALE, TRUE ACTION and MAN’S WORLD). I’m also grateful to Wyatt Doyle for the great layouts he created for the Kaylin anthology and our other books and for figuring out how to crack the color ebook barrier. I’d also like to give a special shout out to our multi-talented friend Jason Cuadrado who created the WalterKaylin.com and WeaselsRipped.com websites for us. In addition to being a web graphics maven, Jason is a movie director and scriptwriter. His new feature-length movie DEVIL MAY CALL stars Corri English, Traci Lords and Tyler Mane and was co-written by Jason and my publishing partner Wyatt Doyle. It will be released in the near future by Lionsgate. DEVIL MAY CALL will probably be coming out not too long after Wyatt’s New Texture company releases a full color print edition of HE-MEN, BAG MEN & NYMPHOS for those readers who still prefer paper over ebooks. I’ve seen the proofs of of the print version and it looks fantastic. Around the same time we’ll also be releasing our third collection of stories from men’s adventure magazines, the CRYPTOZOOLOGY ANTHOLOGY. That one will feature 13 very cool and historically influential stories about Bigfoot, the Abominable Snowman, sea monsters, the Loch Ness Monster and other legendary creatures, amply illustrated with dozens of amazing cover and interior illustrations by many of the same great pulp artists featured in NYMPHOS and several others. Our CRYPTOZOOLOGY ANTHOLOGY will also be released simultaneously in full color print and ebook editions. It will feature a special introduction by the movie and cryptozoology maven Dave Coleman, author of the popular BIGFOOT FILMOGRAPHY, the cryptozoology-based horror novel ANCIENT LAKE and a new film guide titled THE BIPOLAR EXPRESS. Check my previous post for a peek at CRYPTOZOOLOGY ANTHOLOGY if you missed it. 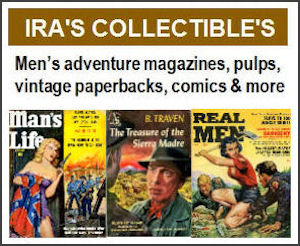 In the meantime, be sure to drop by our Men’s Adventure Magazines Facebook group, where you’ll see lots of posts about vintage men’s pulp adventure magazines and artwork on a daily basis, contributed by me, top collectors and experts like Rich Oberg, David O’Dell and Thomas Clement, and by other fans of the genre from all over the world. 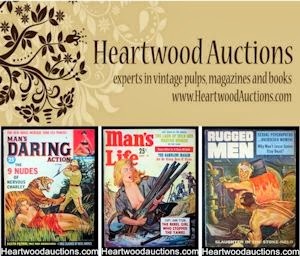 We also maintain a special page Men’s Adventure Library Facebook page, where you can see even posts about men’s adventure magazine stories, writers and artists.